Unlikely as it may seem, a work from the Tyler collection of post-war American prints is hung at the entrance to unDisclosed the second National Indigenous Art Triennial here at the National Gallery of Australia. 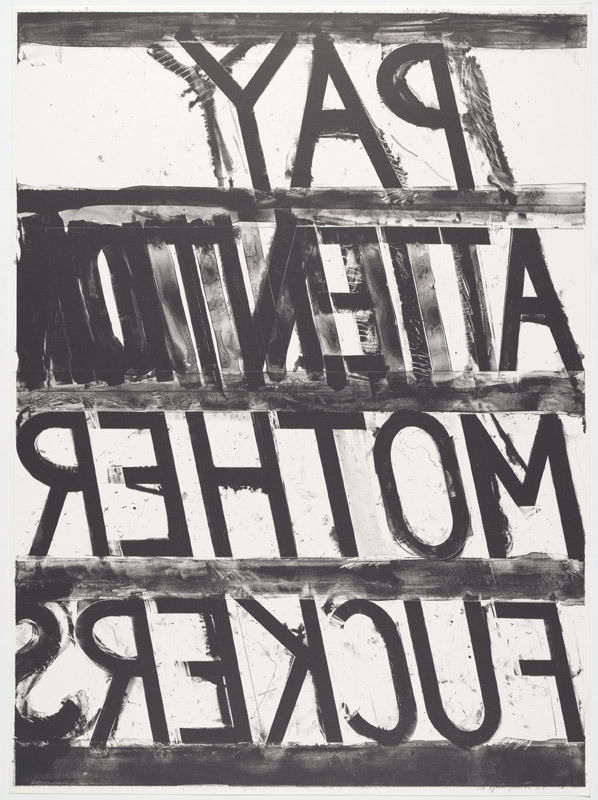 The lithograph, emblazoned with words ‘PAY ATTENTION MOTHER FUCKERS’ printed in reverse, certainly catches our attention: but what is it doing here, as we enter an exhibition of contemporary art by some of the country’s leading Indigenous artists? Bruce Nauman’s work – in painting, sculpture, performance, and print – is often concerned with language. 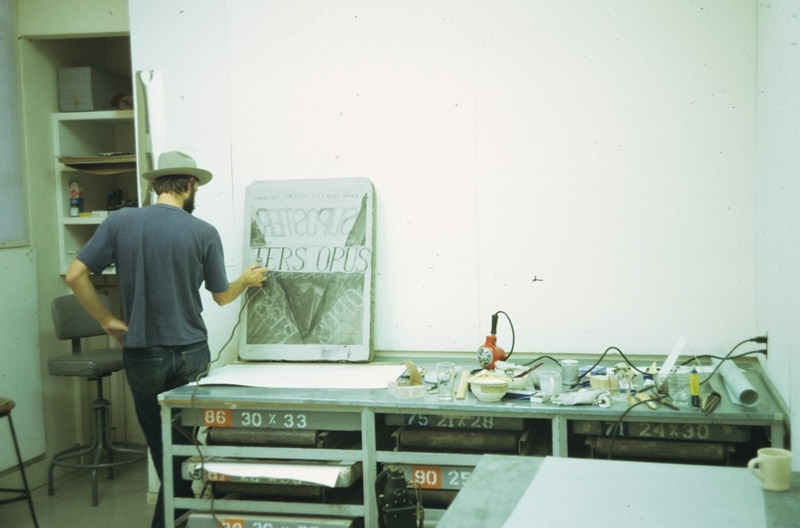 In November 1972 he worked at the Gemini GEL studios in Los Angeles on a group of seven lithographs. These prints explore the construct of language by taking words and phrases as their subject: in Vision Nauman presents a witty take on the idea of double vision. Using narrow black letters, the word ‘vision’ is printed on a pure white ground, making it difficult to read from a distance and prompting the viewer to approach the work for a clear reading. For his reinterpretation of Pay Attention the artist Tony Albert reproduces Nauman’s reversed phrase ‘PAY ATTENTION MOTHER FUCKERS’ and then presents its mirror image. Each of the letters in the work is treated as a discrete object and the installation engulfs the viewer, who has no choice but to ‘pay attention’. Albert’s work is a literal confrontation with language, one that is at once shocking and beautiful. The letters making up the reversed phrase have been individually created by different artists, with Albert himself creating each of the letters in the standard phrase. In this collaboration with artists who work in a diverse range of styles – Judy Watson, Vernon Ah Kee, Richard Bell, Gordon Hookey and many more – Albert draws our attention to the rich diversity of contemporary Aboriginal art, too often marginalised by stereotypical assumptions of what Indigenous art ‘should’ look like. In his essay on Albert (which you can read in full here), Glenn Iseger-Pilkington writes that “throughout international colonial history, the removal of language and voice has been instrumental in abolishing the custodial practice and ritual of Indigenous cultures.” As in much of his practice (read more here), in Pay attention Albert uses language to force viewers to contemplate their preconceptions of Indigenous culture. Each letter stands alone as an individual artwork, but collectively they stand as testament to the vitality of contemporary art and culture in Australia’s Indigenous communities. unDisclosed, the second National Indigenous Art Triennial, is on display at the National Gallery of Australia until July 22. The exhibition will then tour nationally.